CINCINNATI -- The Cardinals are jealous and want to be us. 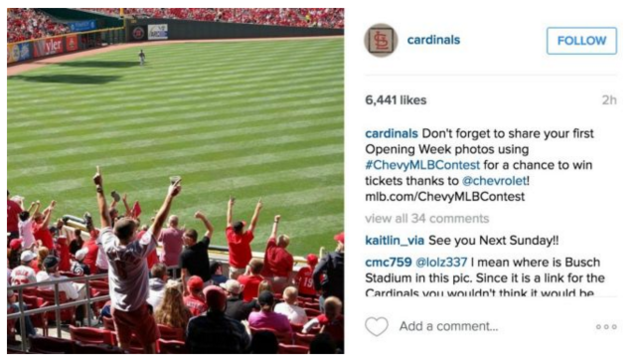 In a promotional Instagram post Sunday, the Cardinals told fans to tweet their Opening Day photos using a special hashtag for a chance to win game tickets. With it, they posted a photo of Cardinals fans cheering from behind left center field. Except the photo isn't really of Cardinals fans or Busch Stadium...it's Reds fans at Great American Ball Park. I get it, they're both red and white. And both of their fields have green grass. But there are a few things that give away this photo's true location. Fox Sports was the first to point out the goof up, but some fans caught on, too. My favorite was Instagrammer @cmc759 who said "I mean where is Busch Stadium in this pic." The post has since been taken down and replaced with one of Cardinals fans -- undeniably wearing STL gear -- getting autographs. But lucky for us, screengrabs exist.